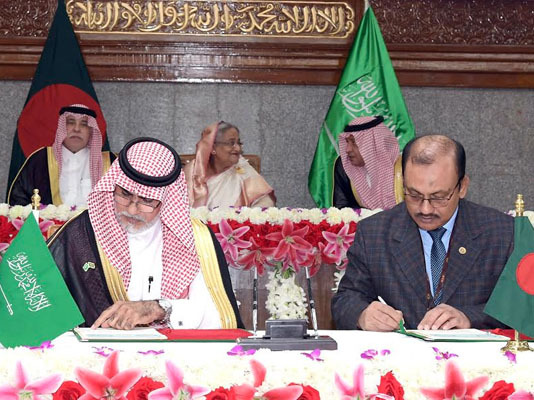 Bangladesh and Saudi Arabia on Thursday signed six instruments for the development of Bangladesh’s different sectors including power and industries. The instruments – two agreements and four memorandums of understanding (MoUs) – were signed in the presence of Prime Minister Sheikh Hasina and visiting Saudi Minister of Trade and Investment Dr Majid Bin Abdullah al Qosaibi and Minister of Economy and Planning Mohammed Bin Mazyed Al-Tawijri at a ceremony at the Prime Minister’s Office in Dhaka. An agreement on construction on 100 megawatt Solar IPP was signed by Alfanar Company of Saudi Arabia and Electric Generation Company Bangladesh Limited. Managing Director (MD) of Electric Generation Company Arun Kumar Saha and Vice-President of Sales and Marketing of Aslfanar Company Kahlid Bin Qabel Al Sulami inked the deal on behalf of their respective sides. The General Electric Manufacturing Company of Bangladesh and Engineering Dimension of Saudi Arabia penned the agreement on manufacturing of transformers and electricity devises. MD of General Electric Sultan Ahmed Bhuiyan and CEO of Engineering Dimension Mohammad Nazib Al Hazi inked the deal. The MoU on manpower export was signed by BMET of Bangladesh and Al Maml Trading Estate of Saudi Arabia. Acting Director General of BMET SK Rafikul Islam and Chairman of Al Maml Trading Estate inked the deal. Bangladesh Chemical Industries Corporation and Yusuf Al Raji Construction signed an MoU on setting up a Urea Formaldehyde-85 plant in Bangladesh. Industries Secretary Md Abdul Halim and Saudi entrepreneur Yusuf Bin Abdullah Al Razi inked the deal. The MoU on establishing Saudi-Bangladesh Biomedical Engineering and Technology was penned by Bangladesh Sugar and Food Industries Corporation (BSFIC) and Al Afaliq Group of Saudi Arabia. Industries Secretary Abdul Halim and CEO of Al Afaliq Group Mohammed Abdulaziz S Alfaleq signed the instrument. Bangladesh Steel and Engineering Corporation and Riyadh Cable Group of Saudi Arabia signed an MoU on producing cable. Industries Secretary Abdul Halim and CEO of Riyadh Cable Group Mohamed Mustafa Mohamed Rafea inked the deal. Ministers and advisers to the prime minister and senior officials of the different ministries were present on the occasion.